In the 1970s I knew a young artist who painted cityscapes and talked about creating a series of New York City views in which the towers of the World Trade Center, then only a year or so old, would appear in every composition. My friend’s idea, which he discussed in a playful and speculative spirit, was to develop a modern urban counterpart to Hokusai’s One Hundred Views of Mt. Fuji. Sometimes the towers would be the focal point; sometimes they would be seen from a curious and unexpected vantage point; sometimes they would be no more than a speck in the distance. The fascination of this projected One Hundred Views of the World Trade Center, which so far as I know never got off the ground, had everything to do with bringing some picturesque poetry to a pair of buildings that were regarded by much of the world as architecturally undistinguished if not downright ugly. My friend wanted to see the towers in rain and in sunshine, in morning mist and in dusky sunset. He wanted to prove that the twin towers, far from being an iconic image engineered to lord over the city, were just one more element in an urban spectacle as various as the people of New York, who see themselves reflected in the city’s forever shifting and multiplying perspectives. Thinking about the years since 9/11, and the impact of the destruction of the World Trade Center on the trajectory of the visual arts in New York in the past decade, the first thing to be said is that the catastrophe did not have a profound effect on the directions that the arts have taken. For some people this may be a regrettable fact, but I would insist that it is something to be celebrated, for it demonstrates that the life of the arts has continued, undeterred. For my artist friend, whose interest in painting buildings and cities and skies had more to do with Corot and Constable than with the new architecture in downtown Manhattan, the twin towers could be no more than an element in the cityscape. Artists, like all citizens, have grappled with the horror of 9/11—and those artists who lived downtown experienced the horror in the most immediate way; but what artists (and dealers and curators) felt most strongly in the wake of the catastrophe was that their work must go on, because the life of art is an essential thread in the fabric of the great metropolis that our enemies set out to destroy. Perhaps nowhere in stricken New York was the need for continuity more powerfully expressed than in the energy with which Philippe de Montebello, the director of the Metropolitan Museum of Art, guided the museum from strength to strength in the months and years after that fateful day. In the aftermath of the disaster, with tourism plummeting and finances perilous, de Montebello insisted on proceeding with plans for an immensely complex and ostensibly arcane exhibition, “Tapestry in the Renaissance: Art and Magnificence,” which opened in the spring of 2002 and demonstrated that the city’s appetite for bold, cosmopolitan artistic investigations remained undaunted. Heterogeneity is the essence of New York. And to the extent that the victims of 9/11 were deeply engaged with the life of New York—and of the greater metropolitan area, and of the United States—their engagement was so fluid and multi-layered, so much a matter of the individual finding fulfillment in the great democratic possibilities, that the only way to salute what they died for is to pursue those possibilities. We must reaffirm the pluralism of this city and this country, rejecting “European-type landmarks” and all they imply in the way of centralized authority. No bricks-and-mortar monument could do justice to the people who died on 9/11, and this truth has been brilliantly embraced in Michael Arad’s design for the memorial, which is mostly a matter of trees and water and open space—an anti-monument that does not fix a person’s thoughts so much as it allows a person to think and feel freely. The intuition that the arts, not only painting and sculpture but also literature and music and dance, can be expressions of democratic and pluralistic experience was originally a European intuition. But in London, Paris, Berlin, and St. Petersburg, the new possibilities were always set against a backdrop of monuments and other works of art that asked to be, to borrow James’s words, a “holy of holies, a great temple jealously guarded and formally approached.” Even in New York, which embraced the modern mandate to regard art as first and foremost the public expression of private feeling, older questions remained about the obligation of the arts to larger social and political forces, even if the Church and the State were sometimes replaced by the People. Meyer Schapiro’s assertion, in 1957, that the artist must “cultivate his own garden as the only secure field in the violence and uncertainties of our time,” though embraced by many, struck others as an aesthete’s escapism, especially when they were confronted with the assassinations of the 1960s and the Vietnam war, and later with 9/11 and Abu Ghraib. Whatever one wants to call it—political art, protest art—New York has had its fair share of it. Much of it is easily dismissed. Eric Fischl’s sculpture of a falling or tumbling figure, conceived to commemorate the deaths at the twin towers, registers as a sentimental anecdote, in no way equal to the challenge of its dark occasion. But it is not so easy to dispose of the impulses that lay behind Barnett Newman’s decision to commemorate the American protests against the Vietnam war with a sculpture, Lace Curtain for Mayor Daley, that consisted of an ascetic grid of barbed wire; although Newman’s work, too, makes of art a means rather than an end. No catastrophe, including 9/11, can justify the subordination of art to lessons and messages—art becoming a medium for the communication of certain ideas, rather than what it must always remain, which is a form of communication with ideas of its own. Art’s power in the face of tragedy is owed to metaphor and metamorphosis as agents of catharsis. The only work of art done in modern times that strikes me as even approaching the challenges of 9/11 is Picasso’s Guernica, painted in a matter of weeks in the spring of 1937 in response to the aerial bombardment of the Basque town by German fighter planes, and exhibited that summer at the Spanish Pavilion of the Paris International Exposition. There is a combination of grandeur and intimacy in Guernica that feels right for the memory of 9/11, a sense of catastrophe that does not overwhelm or eradicate the quality of individual response, the pain of the particular, so unforgettably registered in Picasso’s howling mouths and clenched or outstretched hands. Picasso’s shattering of the natural order is radical enough to take the measure of the terrorists’ radical evil, while the classicizing strain in his imagination, by turning each horrific incident into a heroic fragment, provides some uneasy solace. Picasso does not revel in horror the way certain twentieth-century Expressionists, such as Otto Dix and José Clemente Orozco, are wont to do. The formal eloquence that he brings to his terrifying subject matter does not aggrandize the suffering so much as it brings some order to the chaos. What struck me as I looked at Guernica and thought about 9/11 was that Guernica was not so much a protest picture as it was an elegy, a lamentation. The bodiless head in the foreground of Guernica is suspended between catastrophe and commemoration, an image of immediate human pain that before our eyes turns into a classical statue, an allegory of human suffering that one might have found in the home of an Athenian philosopher. It should not surprise us that Guernica, which has so often been seen as prefiguring the horrors of the London Blitz, Pearl Harbor, the Dresden bombings, and Hiroshima and Nagasaki, should come to mind when one thinks of 9/11. Long before 2001, Guernica’s history was knit into the history of New York, where it was exhibited at the Museum of Modern Art from 1939 to 1981, first deposited by Picasso for safekeeping during the war and then left in Manhattan, so he said, until the Fascists should no longer rule Spain. In New York, the mural—which had initially struck some on the Spanish Left as too personal and abstract to adequately represent the Republican cause—came to define, for the museumgoing public, the artist’s engagement with society. But for New York’s avant-garde painters, especially in the 1940s, Guernica’s meaning may have been more equivocal, suggesting that the artist could only succeed by reframing public experience in a private language. For artists, the lesson of Guernica was not so much about the necessity of responding to catastrophe, but about the necessity, in the wake of catastrophe, of going back into the studio, of continuing the work of abstracting and structuring and formalizing one’s feelings. The echoes of Guernica’s monochromatic palette and jagged, puzzle-like yet explosive forms can be found in the work of Pollock, de Kooning, Kline, Motherwell, Pousette-Dart, and countless other artists. They all must have known the story, published by Alfred Barr in 1943, that Picasso, living in occupied Paris, had been visited by a German official who on leaving his studio had noticed a photograph of Guernica and said, “Ah, Monsieur Picasso, so it was you who did that.” To which Picasso replied: “No, you did.” He was insisting on the essential distinction between art and reality, and perhaps suggesting that the artist’s responsibility was for the painting, and nothing more. Of course it was not at the Museum of Modern Art on 53rd Street, but downtown, closer to the future site of the World Trade Center, that the implications of Guernica were most deeply assimilated. Nowhere was that assimilation more thoroughgoing than in the black-and-white paintings that de Kooning created in the late 1940s, subjecting Picasso’s already shattered anatomies to ever-greater pressure as he struggled with his inchoate responses to the city’s saturnine poetry. Picasso’s war work gave way to de Kooning’s urban lyrics. The finest record we have of the day-to-day experiences that animated paintings such as Attic and Mailbox is in the writings of de Kooning’s friend Edwin Denby, the poet and dance critic, who remembered “walking at night in Chelsea with Bill during the depression, and his pointing out to me on the pavement the dispersed compositions—spots and cracks and bits of wrappers and reflections of neon-light—neon-signs were few then—and I remember the scale of the compositions was too big for me to see it.” Their perambulations may have sometimes taken de Kooning and Denby way downtown, through the Village, across Houston Street and Canal Street, into what would become the precincts of the World Trade Center. There is not a street or an alley in downtown Manhattan where some artist has not looked for a studio or wandered late at night. What was perhaps the most striking (and fantastical) proposal for a 9/11 memorial, Ellsworth Kelly’s collage with a green trapezoid suspended above the craters of the towers, came from a painter who in the 1950s lived way downtown at Coenties Slip, and was certainly familiar, long before the World Trade Center was conceived, with the blocks on which it would be built. By the time the World Trade Center went up, de Kooning had moved to Long Island, but the twin towers became an element in the New York of the artists, and it hardly mattered that for most painters and sculptors they represented an alien universe dedicated to business and finance. 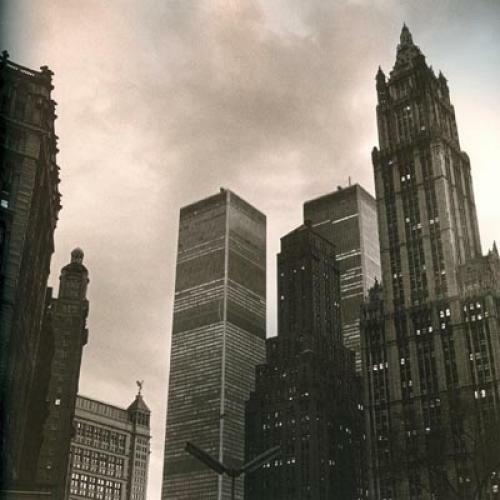 Few impressions of the towers are as moving as a photograph taken by Peter Hujar in 1976, one in a series of bewitching views of the city between dusk and dawn. Hujar looks up at the twin towers, which are juxtaposed with the Gothic intricacies of the Woolworth Building and some other older downtown skyscrapers. The minimalist forms of the towers, suggesting sculptures by Tony Smith or Richard Serra, are rendered murky and muffled by the surrounding twilight, so that their massiveness feels inscrutable, as if it enclosed some ancient secret. Hujar knits the two thrusting towers into his own dreamlike downtown drama; they are as disquieting as the railroad train in a Metaphysical landscape by de Chirico. Like my painter friend in the 1970s, Hujar was locating the twin towers not in some official New York, but in his own private New York. And in the wake of the horrors of 9/11, artists have been right to by and large follow what have always been their own meandering paths through this city of dreams and realities. The honor of art, which is part of the honor of New York, rests as much in the recognition of the extent to which the artist cannot affect the world as in the recognition of the extent to which the artist can. Jed Perl is the art critic for The New Republic. This article originally ran in the September 15, 2011, issue of the magazine.